I actually got the shade Peachy Love in the black Friday sale for £15! They are usually £30. Even at £30 they are still a good price as it works out £10 a blush which is roughly what you pay for many drugstore brands. There are five trio's to choose from including many shades and ones to suit light to dark skin tones. I decided to go with Peachy Love as I mainly own pink blushers and wanted something different to what I already own. Firstly just look at that packaging! The photo doesn't even do it justice. I love all the mini logo's on it and they shine differently as you move the compact. Inside the company you have three blushers are a good mirror. It is slightly bulky but not heavy at all, I like it being a little bulky as it makes it perfect for travelling with. When I opened the compact I was pleasantly surprised as each blush has a different finish which I didn't expect.The one on the right has a gorgeous satin finish which looks incredible on the skin. I find it doesn't look too shiny but gives a subtle satin finish as you turn your head. The shade is extremely pretty being more of a pinky peach. Then the middle shade has a matte finish. This is a more deeper peach that looks gorgeous with a glowy bronzer. Lastly is a pale peach which has a slight shimmer to it. I don't usually tend to like shimmery blushers but this shimmer is subtle and looks beautiful on the cheeks. The shades are all extremely wearable and perfect for everyday use. The shimmer doesn't show up much in the photo but on the cheek it looks very pretty. I did find all three of the blushers are extremely pigmented which I don't mind as I just make sure to tap my brush into the product, tap the excess off then use a light hand and the shades all work incredibly well. I find the blush stays put all day long. I do love drugstore blushers but find alot can fade as the day goes on, especially when it has been a long day at work but these ones all stay like they were first applied. I will definitely be picking up another trio soon! 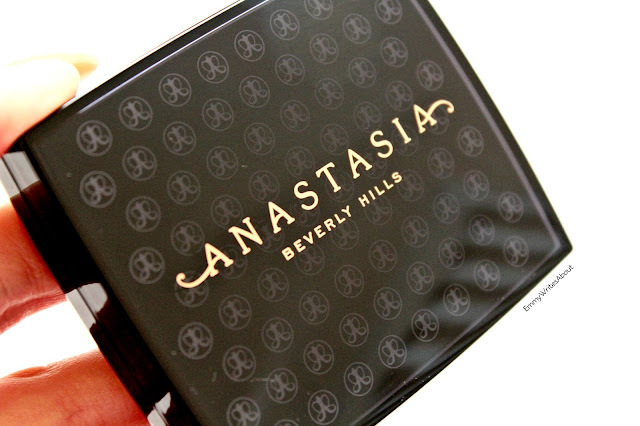 You can buy them directly from the UK Anastasia Beverly Hills Website or the US Website.